Suggested tune: MIT FRIED UND FREUD ================================ Mit Pried und Freud ich fahr dahin. M. Luther. [Nunc Dimittis.] This free rendering of the Song of Simeon (St. Luke ii. 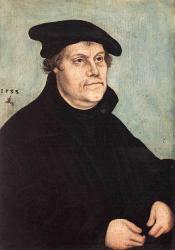 29-32) was first published in the Geystliche gesangh Buchleyn, Wittenberg, 1524, and was included by Luther in 1542 as one of the six funeral hymns in Christliche Geseng... zum Begrebniss. In Wackernagel, iii. p. 17, in 4 stanzas of 6lines; in Schircks's edition of Luther's Geistliche Lieder, 1854, p. 88; and in the Berlin Geistliche Leider, ed. 1863. This noble swan-song, as Bunsen calls it, has comforted many, princes and pious Christians, in their last hours. Lauxmann, in Koch, viii. 580, gives various instances of its consoling effects, stating, e.g., that Prince Charles of Anhalt, during his last illness in 1561, comforted himself with it, and if with trembling voice, yet with joyful heart, sung the whole hymn a quarter of an hour before his death.